It has been too long since I’ve gone to the ocean. Too long since I’ve heard the waves crash onto the shore, felt the tug of the tide beneath my feet. This week, I was able to go twice. At Carlsbad, the riptide was fierce and I only went in up to my waist, not wanting to drown. But the second time? We went to a small cove just outside of Channel Islands Harbor. Hubby has taken the kayak out onto smooth water, and he’s going out and around the breakwater instead of around the harbor itself. I’ve settled into my new beach chair, a big-brimmed hat shading my face, arms & legs covered and a book in my hands. The sky is impossibly September blue. Two white wisps of cloud make the blue even bluer. Further out, a marine layer hides the Anacapa Islands across from the breakwater, 3 or 4 miles away. The waning moon overhead is heading west, and a crow and a seagull troll the shoreline, looking for food. 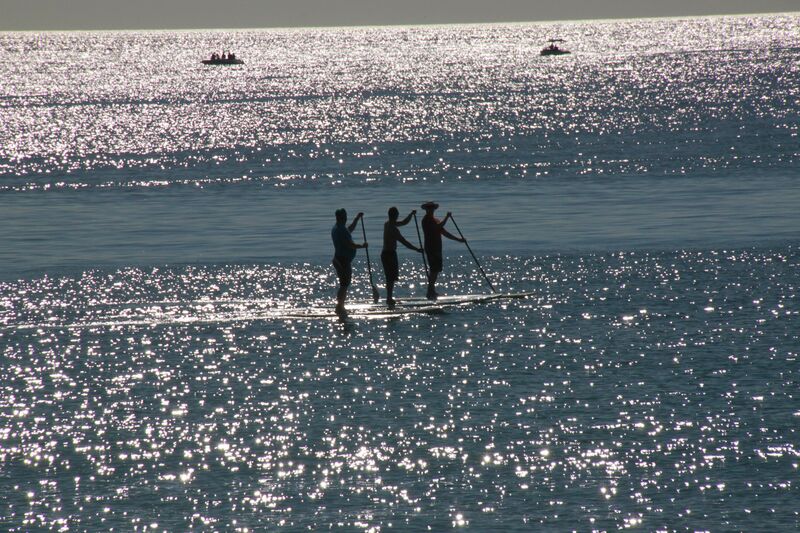 Three paddle surfers at Carlsbad, California taken by me, February 2012. The crow is cawing, disturbing my reading so I watch him for a bit. He keeps cawing, but no other crow is showing up. It looks like he got the wrong directions to the party, lol. At the crow’s feet, the water is a dull brown, with a white ruffle as a small wave laps at the beach. The water turns to a muddy green a little further out, before melting into a sweep of sweet blue. There’s a tern bobbing out there, in the middle of my oh-so-private bay. It’s kind of amazing. On this big, wide cove, there’s only one other person and they are very far away. There’s a gentle breeze and the sand is getting hotter. The crow still caws, the seagull has launched itself into the water, the tern is in a contemplative mood. With a sudden flip of his wings, the crow flies off in a huff to find his crow-friends. I can hear seals, but I cannot see them in my part of the bay. A small white butterfly skims the edge of the beach, looking quite out of place. I finally abandon my book and give myself up to the lure of the water. There are hundreds of sandcrab shells littering the high tide line, and as I wade into the cool Pacific ocean, more dead sandcrabs bob on the surface of the water. I strike out, get beyond the ghoulish bodies, and float on the chilly water, treading when necessary as a mere ten feet away from the shoreline has me out of my depth. The water invigorates me. Reminds me that I am alive, and gaining in health and strength, and lucky to be able to do what I love. I have new challenges on my plate for next year, but I’m ready for them. Right now I feel I can take over the world, lol. The hubby comes back, rhapsodizing over the pod of porpoises that swam around him, and that he followed, for about twenty minutes. We are both renewed by our time in and on the water. Ahh. There’s nothing that a bit of salt water and a briny sea breeze can’t cure. Sometimes, I only need to get my feet wet, my hands wet, pat my wet hands on my cheeks. Other times I need the full-immersion therapy. How long has it been since you’ve allowed yourself the luxury of going into the water at the beach? 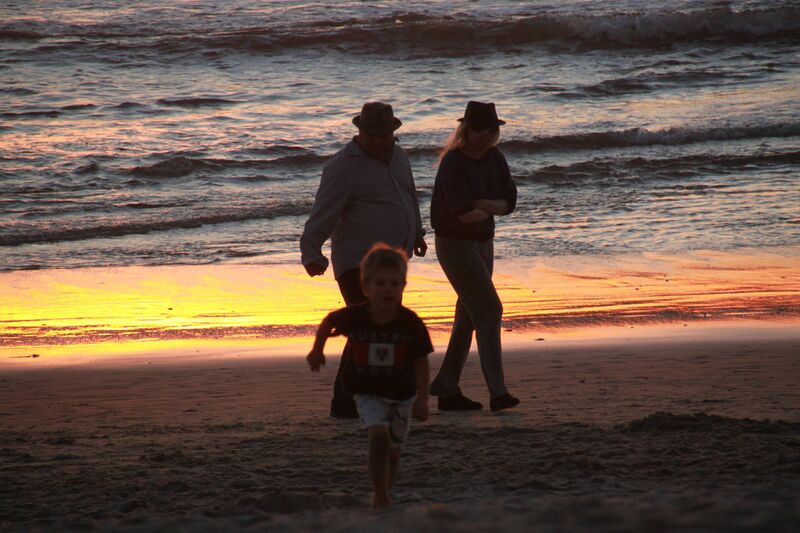 Family at Carlsbad, California at sunset. 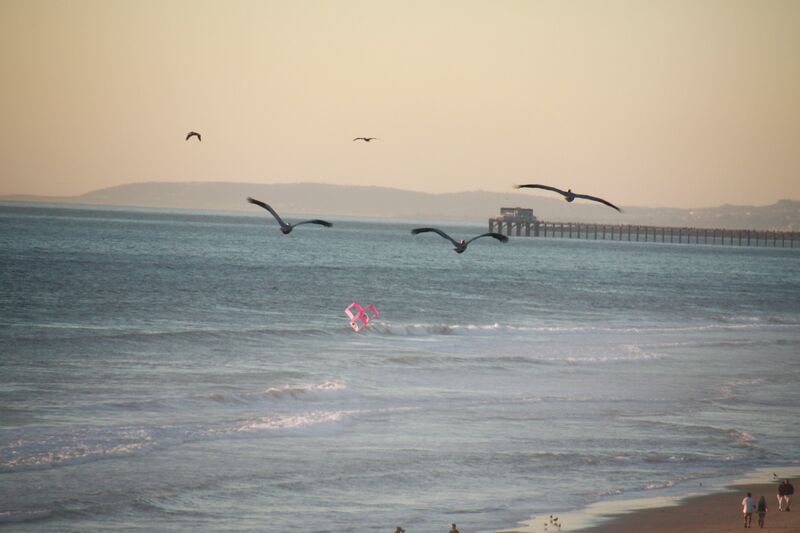 Taken by me, February 2012. I need to note – the above picture is NOT of my family. They were strangers on the beach at sunset. I was actually going for the pretty colors in the water, lol! This entry was posted in Life, Observations and tagged Carlsbad, Channel Islands Harbor, Christine Ashworth, renewal. Bookmark the permalink. Gorgeous. Such a peaceful, calming story. You’re a good photographer. I especially love that shot of the three paddle surfers. The water looks like a bed of spilled diamonds. Roben, I was trying like crazy to accept any offer my hubby made me last week, before I had to come back to the day job. This was such a gift of a day. And thanks for the compliment! Hubby bought me this fantastic camera for Christmas a couple of years ago, and we’ve been having a great time on photo safaris. Finally a hobby we can do together! “spilled diamonds” – yes. Beautifully put! I love the beach and know exactly what you mean. I was just there a few weeks ago. But would go every day if possible. If I lived closer, that would help. We keep telling our sons they need to make lots of money and buy us a house on the beach, lol! If conditioning works, we’re set. The beach is my favorite place to be! Oh, and I love to paddle board! The water is just so gosh darn cold here, though, that I don’t go in much passed my knees. But take me somewhere tropical and you can’t get me out. 🙂 Great pictures, Christine. I agree with Roben, you’re a good photographer! I feel more zen and centered after simply reading your post! There is something fundamentally life-affirming about having sand between our toes. I can never properly describe why, but you captured the sense of it perfectly. Aw, thanks, Sam! Yeah – there’s nothing like the beach. I am a mountains girl, too, but my first love is the beach. Lovely post, Christine! Your photos and descriptions are so well done. I raised my kids a few miles from the Carlsbad beach, and remember – not so fondly – the clean-up involved following a trip there! Sometimes, we’d grab a take-out pizza and load our young family in the car and head to the beach. We’d sit on the rocks above the beach and watch the sunset and share our family dinner. Those were special times. Thanks for the memory, and so glad you’re feeling better! Love the beach, and don’t go as often as I should – but am going TODAY. So your post just reminds me of all the gorgeous things about it. Glad you’ve had that break before heading back to day job duties.